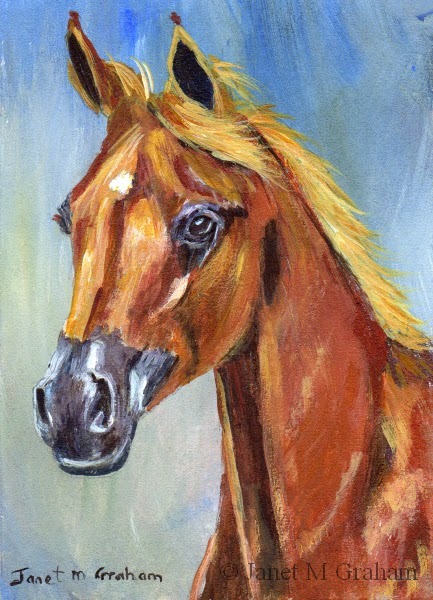 I haven't painting an animal aceo for ages so decided to paint this beautiful horse. Really pleased with the final painting. Think I will look for some more horse reference photos as I enjoyed painting this one. Arabian Horse measures 2.5 x 3.5 inches and is painted on 300gsm smooth Arches Watercolour paper. Many thanks to Ainslie G for the reference photo. I love painting these little landscape aceo's. Really pleased with how this one turned out. 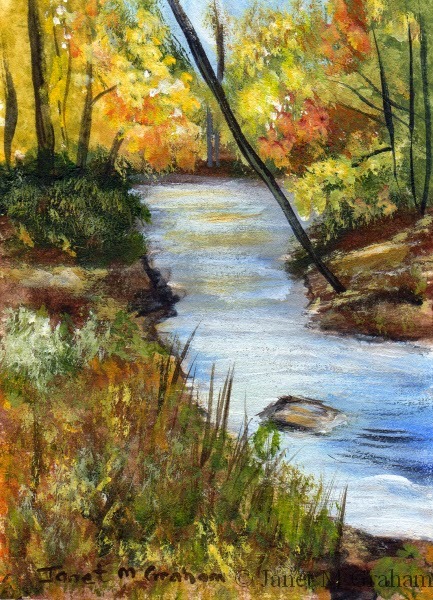 Fall Stream measures 2.5 x 3.5 inches and is painted on 300gsm smooth Arches watercolour paper. Many thanks to Craig C Johnson for the reference photo. I have had this one printed out for ages to paint. Just wasn't sure if I would be able to paint it in such a small format. I used the no 2 rigger brush which worked perfectly. Really pleased with how the painting turned out. These birds can be found around Australia except in Tasmania. They are a medium size bird ranging from 21 - 28 cm in length and weigh around 27 grams. 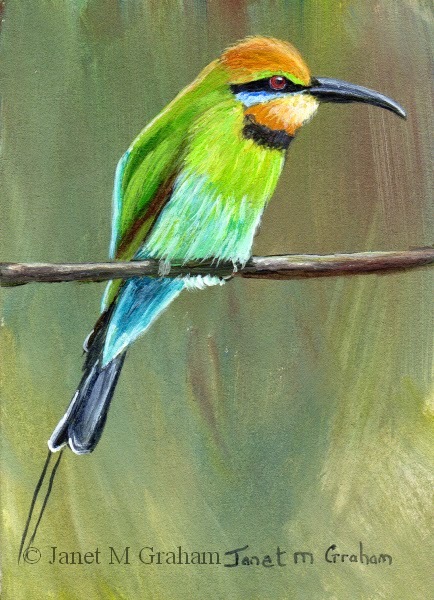 Rainbow Bee Eater measures 2.5 x 3.5 inches and is painted on 300gsm smooth Arches watercolour paper. I used a different brush to paint this one - my trusty no 3 round brush is not holding its point so I used a no 2 rigger instead. It actually works really well so it is a good substitute. I must order some more brushes from the UK - they were closed over Christmas so will have to wait until the New Year to place my order. The White Fronted Bee Eater is found across Sub - equatorial Africa. They measure around 21.5 - 23.5 cm in length and weigh between 28 - 38 grams. 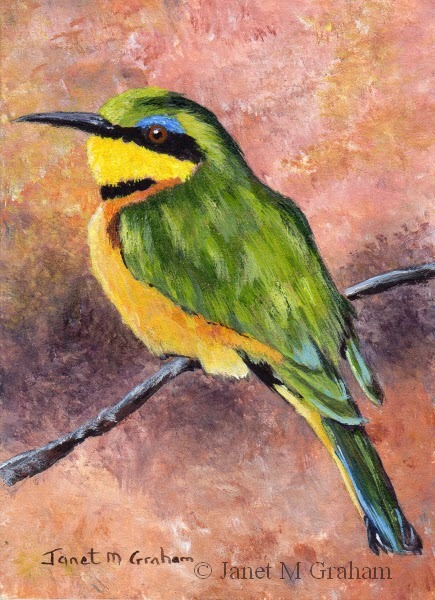 White Fronted Bee - Eater measures 2.5 x 3.5 inches and is painted on 300gsm smooth Arches watercolour paper. Many thanks to Derek Keats for the reference photo. I decided to paint this one in watercolours. Really pleased with how it turned out. I finished my Christmas shopping today - thank goodness - shops were hectic as usual. Wishing everyone a Merry Christmas and a Happy New Year. 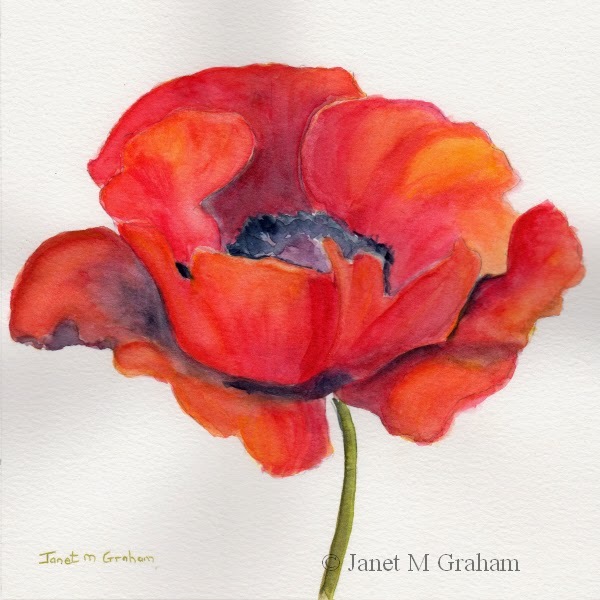 Poppy measures 8 x 8 inches and is painted on 300gsm Daler Rowney "The Langton" NOT watercolour paper. The Galah is one of our most familiar parrots found across most of Australia. They measure around 35 - 36 cm in length and weigh on average 337 grams. 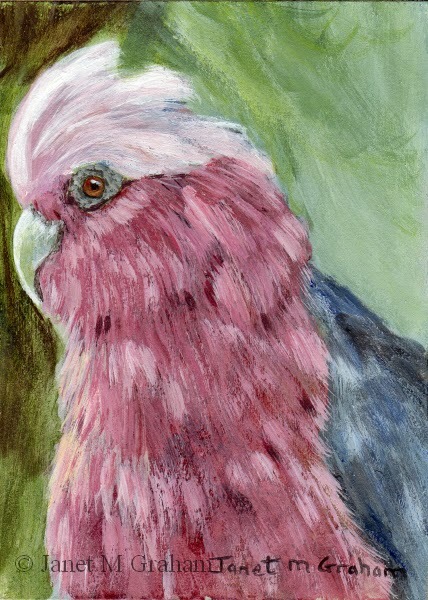 Galah measures 2.5 x 3.5 inches and is painted on 300 gsm smooth Arches watercolour paper. I love the colours of the Rainbow Lorikeet. This one was visiting the Honey Gem plant that is in flower at the moment in my back yard . I managed to take a few good reference photos. Rainbow Lorikeets are found across the northern and eastern coastal areas of Australia. They measure 28 - 32 cm in length and weigh on average 133 grams. 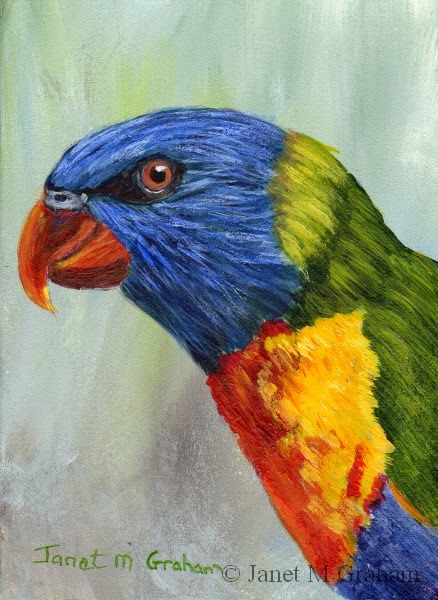 Rainbow Lorikeet measures 2.5 x 3.5 inches and is painted on 300 gsm smooth Arches Watercolour paper. 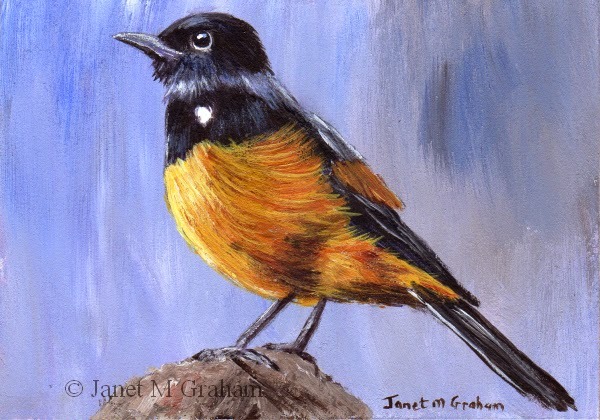 Robin's are one of my favourite birds to paint. I managed to see one when down at Marcoola Beach in October - there was a nature corridor in front of the beach. Managed to see quite a few different birds but, unfortunately, I never got any good photos. Have to plan another mini break. 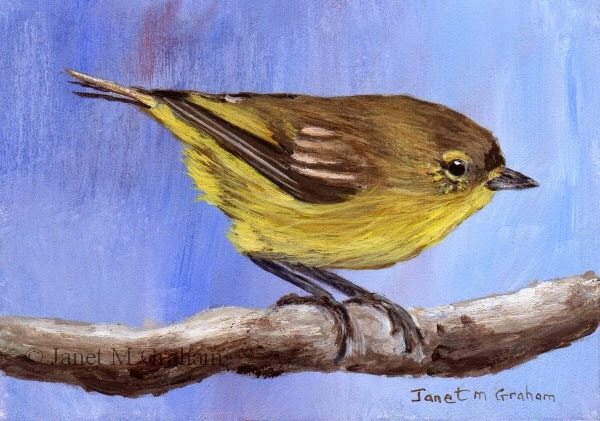 Eastern Yellow Robin measures 6 x 6 inches and is painted on Raymar Feather Lite Canvas Panel. 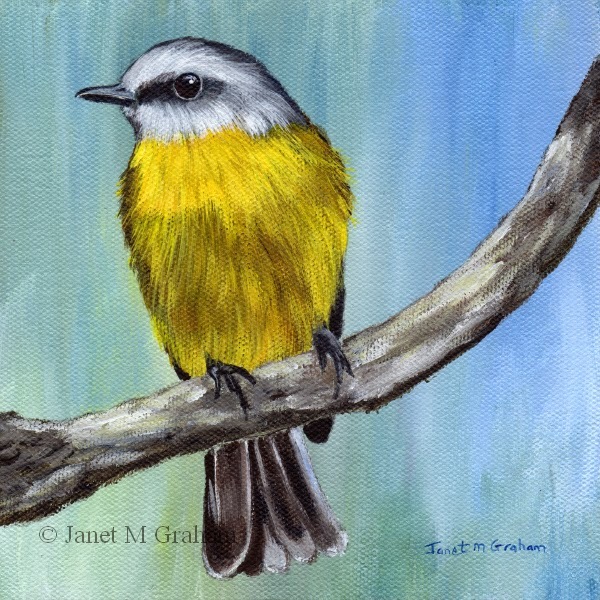 I couldn't resist painting this cute fellow - just love the way he is positioned on the branch. This one is in his winter plumage - in spring he will molt and be a vibrant yellow. 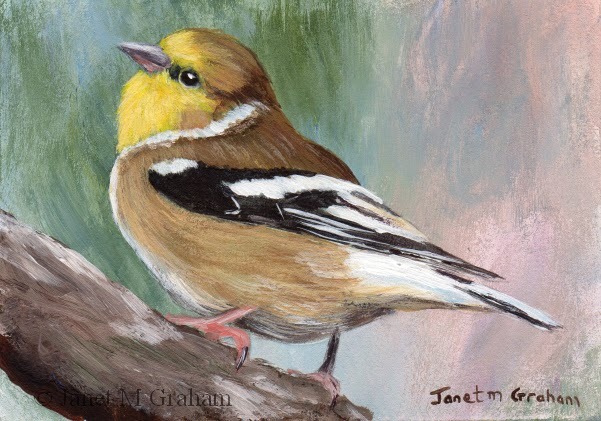 American Goldfinch measures 3.5 x 2.5 inches and is painted on 300gsm smooth Arches Watercolour paper. This one was fun to paint. The reference photo was black and white so I decided to paint it as a sunrise scene. Did a little study painting first to decide on the colours combination etc. Really pleased with how it turned out. 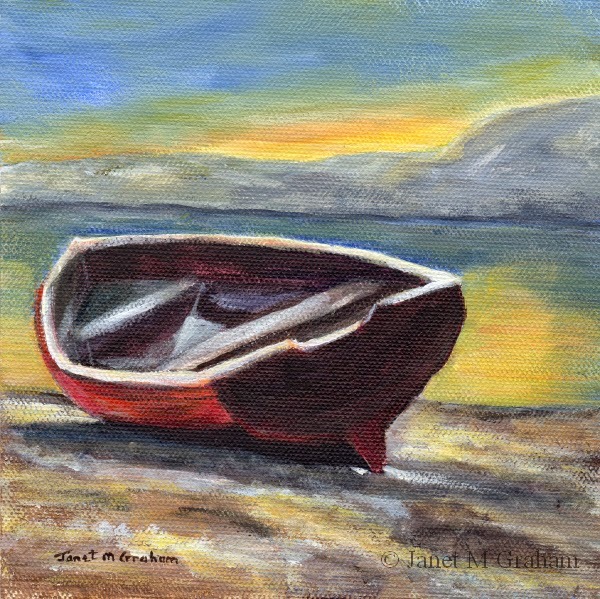 Sunrise over the Bay measures 6 x 6 inches and is painted on Raymar Feather Lite Canvas panel. I have had this one printed out for ages to print. Really pleased with how it turned out. They are a strange looking bird - I wouldn't like to come across one in the bush as they can do same serious damage with their claws. The Cassowary is found in North Eastern Australia and the tropical forests of New Guinea. Cassowaries are around 1.5 - 1.8 metres tall and weigh around 58.5 kilograms. They can run up to 50km/hour through dense forest!! 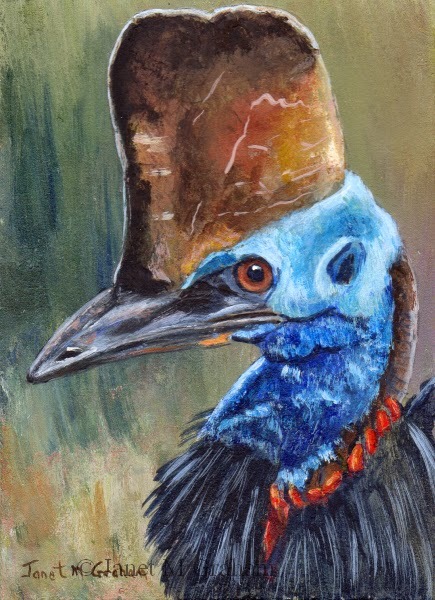 Cassowary measures 2.5 x 3.5 inches and is painted on 300gsm smooth Arches watercolour paper. I enjoyed painting this one. I am thinking about painting a larger version as I just love the intensity of its gaze. 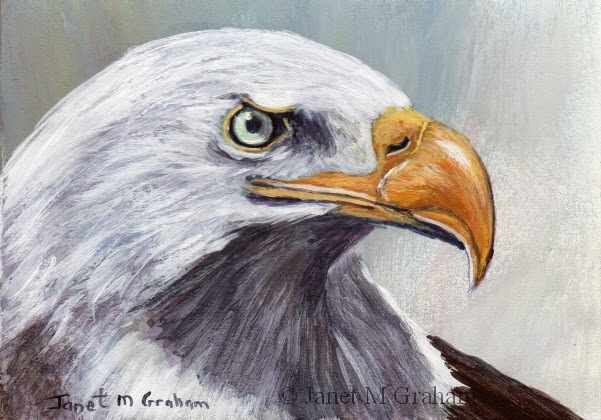 Bald Eagle measures 3.5 x 2.5 inches and is painted on 300gsm smooth Arches Watercolour paper. The Willow Warbler is found across Northern and temperate Europe and Asia. It measures around 11 - 12.5 cm in length and weighs between 7 - 15 grams. 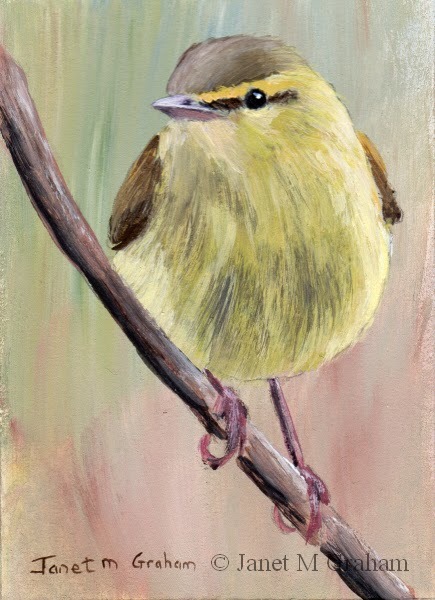 Willow Warbler measures 2.5 x 3.5 inches and is painted on 300gsm smooth Arches watercolour paper. 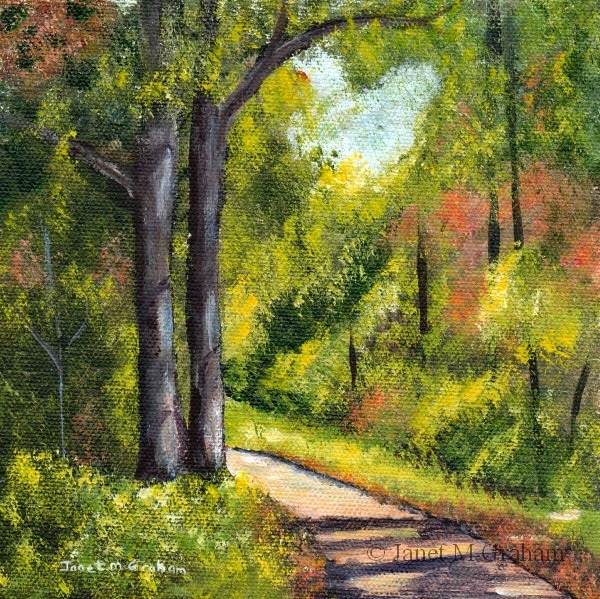 Forest Pathway measures 6 x 6 inches and is painted on Raymar Feather Lite Canvas Panel. Many thanks to Sylvia M Lang for the reference photo. 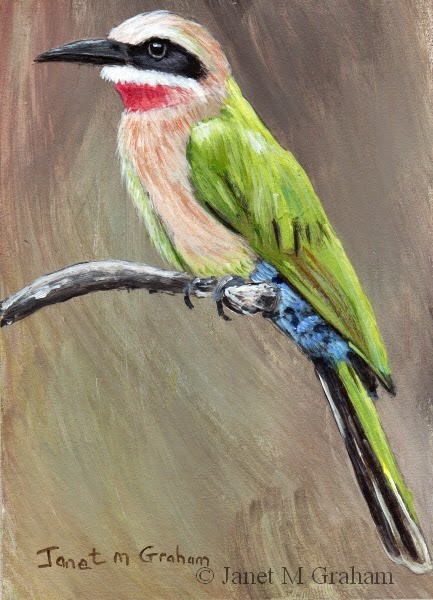 I couldn't resist painting this cute little fellow - just love the way he is perched on the branch. 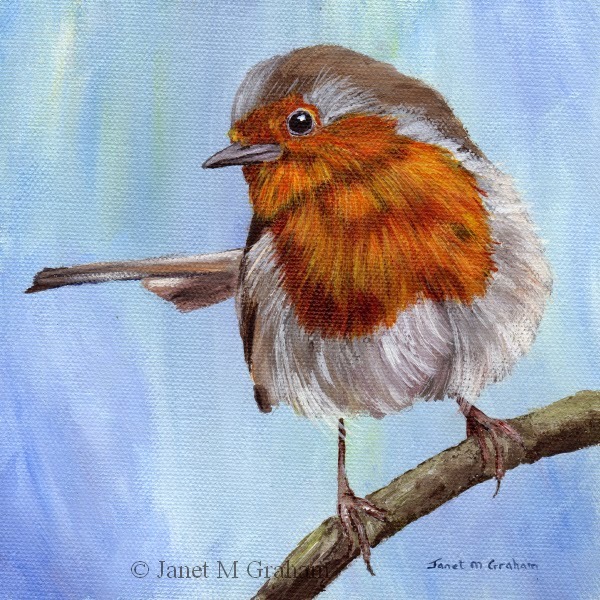 Robin measures 6 x 6 inches and is painted on Raymar Feather Lite Canvas panel. Many thanks to Margaret Battye for the reference photo. I enjoyed painting this one - everything just worked. The Cape White - Eye is native to southern Africa and is found in South Africa, Mozambique, Botswana, Lesotho and Swaziland. They measure around 12 cm in length. Cape White Eye measures 2.5 x 3.5 inches and is painted on 300gsm smooth Arches watercolour paper. The Vermilion Flycatcher is found in southwestern United States and southward into South America. They are around 13–14 cm in length and weigh between 11 - 14 grams. 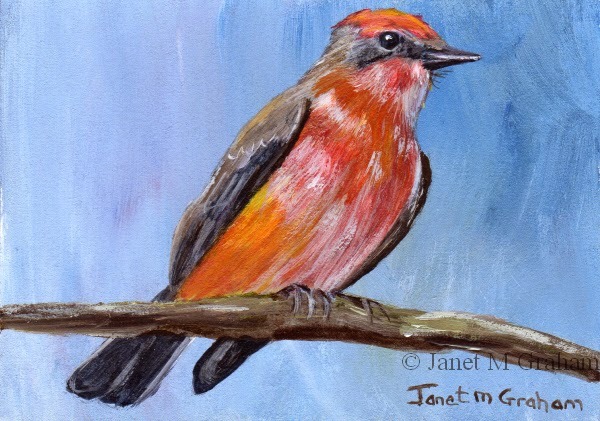 Vermilion Flycatcher measures 3.5 x 2.5 inches and is painted on 300gsm smooth Arches watercolour paper. I really enjoyed painting this one - everything just seems to work. 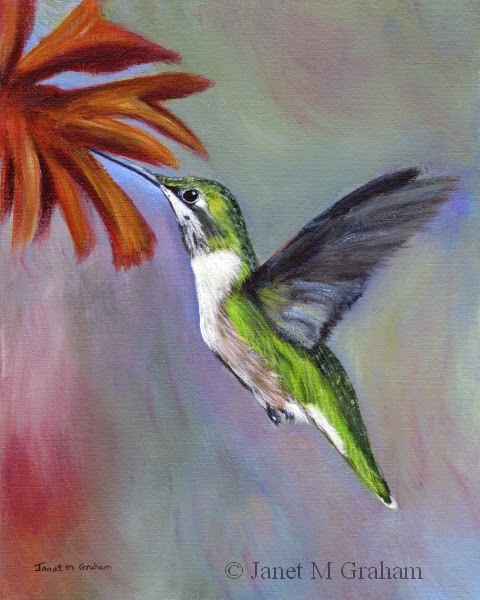 Ruby Throated Hummingbird measures 8 x 10 inches and is painted on Fredrix Archival Watercolour Canvas Board. 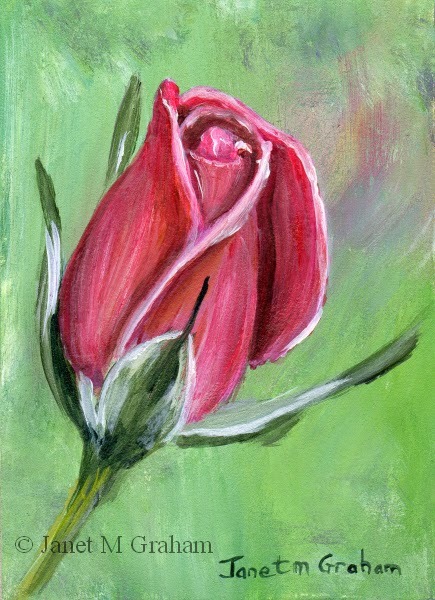 Pink Rose measures 2.5 x 3.5 inches and is painted on 300gsm smooth Arches watercolour paper. This one was fun to paint and everything just seemed to work. The Tufted Coquette is a tiny hummingbird measuring only 6.6 cm and weigh around 2.3 grams. They are found in Venezuela, Trinidad, Guiana and Northern Brazil. 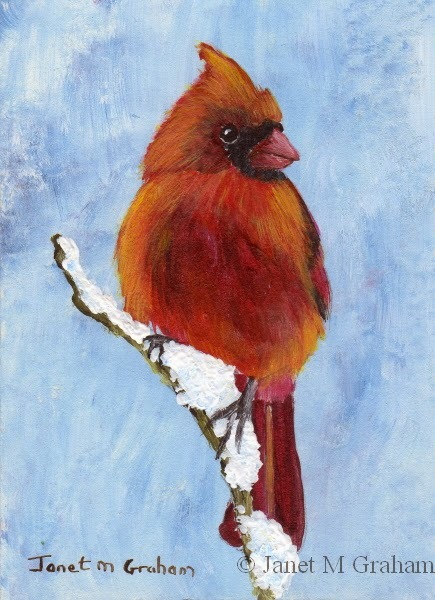 I love the red plumage of these birds - just a bit tricky to paint but I got there in the end. measure 21 - 23 cm in length and weigh between 42 - 48 grams. Red Cardinal measures 2.5 x 3.5 inches and is painted on 300gsm Arches smooth watercolour paper. Many thanks to Lisa J Johnson for the reference photo. A few weeks ago, I had short break away to Marcoola Beach on the Sunshine Coast. (About an hours drive away). It was a lovely spot with spectacular sea view and this was the view from my accommodation. 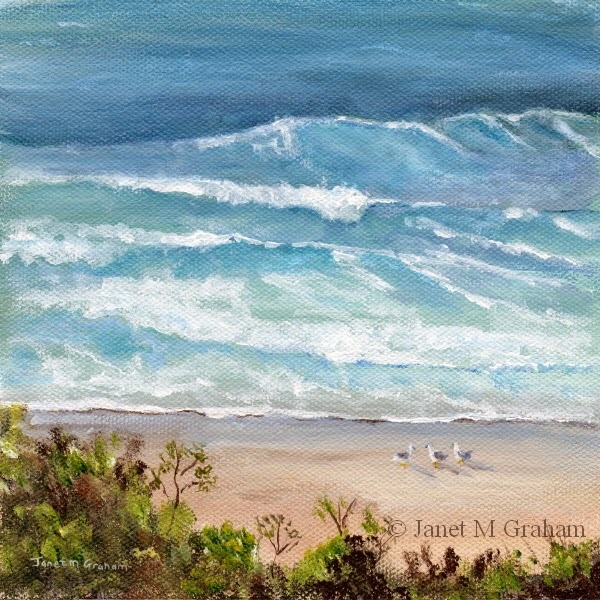 Marcoola Beach measures 6 x 6 inches and is painted on Raymar Feather Lite Canvas panel. 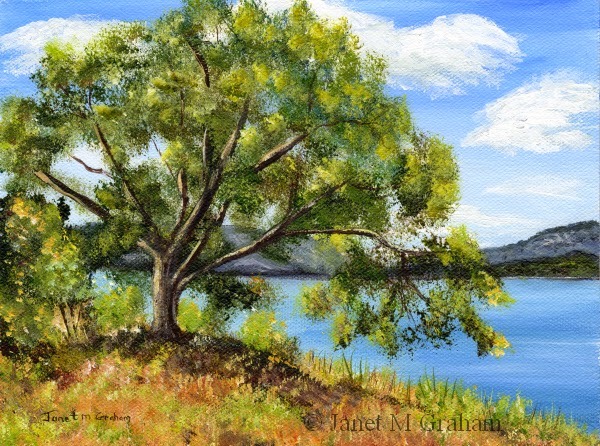 Lakeside Tree measures 8 x 6 inches and is painted on Raymar Feather Lite Canvas Panel. Many thanks to Anita Johnston for the reference photo. Also on my walk on Sunday, I came across some Red Backed Fairy Wren's. This little female sat for a while so I managed to take a few photos of her before she flew off. I just love the position she is perched on the branch. Really pleased with the painting. Red Backed Fairy Wren's are found in North and East Australia. They are the smallest of the fairy wrens measuring between 9 - 13 cm's of which 6 cm's is their tail. They weigh on average 8 grams. Red Backed Fairy Wren (Female) measures 3.5 x 2.5 inches and is painted on 300gsm smooth Arches Watercolour paper. The other day when driving, two birds nearly flew into my car near the one lake in my area - fortunately they swerved in time. I managed to see their colouring out the corner of my eye and they looked like sacred kingfishers. I didn't realise they were in my area so on Sunday I went for a walk looking for birds. I was really lucky - I saw a bit of blue in a tree and zoomed in (thank goodness for 50x zoom cameras) and it was the sacred kingfisher - I was so excited to see it and managed to take a few shots. Fortunately the one photo was good enough to use as a reference. Sacred Kingfishers are a medium size kingfisher found throughout the coastal areas of mainland Australia and parts of Tasmania. They are also found on islands from Australasia to Indonesia and New Zealand. They measure 19 - 24 cm in length and weigh on average 45 grams. 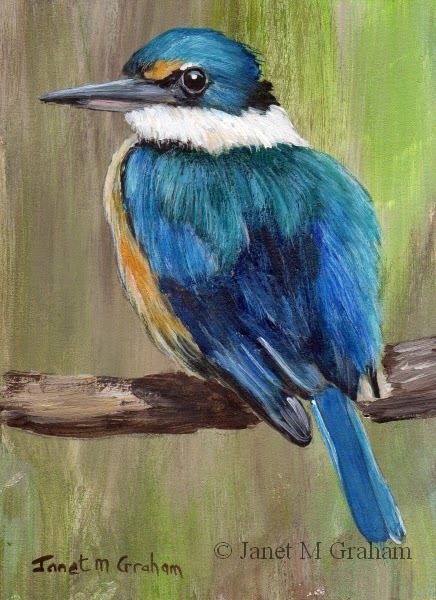 Sacred Kingfisher measures 2.5 x 3.5 inches and is painted on 300gsm smooth Arches Watercolour paper. I love how this little guy is perched on the branch. The Ruby Crowned Kinglet is found in North America. They are a tiny bird measuring only 9 - 11 cm in length and weight between 5 - 10 grams. An interesting fact about this bird is that they can lay up to 12 eggs!! An entire clutch of eggs can weigh as much as the female. 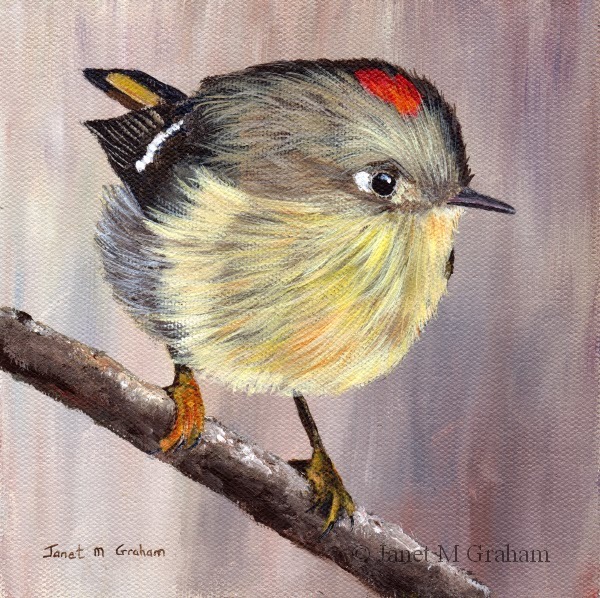 Ruby Crowned Kinglet measures 6 x 6 inches and is painted on Raymar feather lite canvas panel. Many thanks to Nigel for the reference photo. The Buff Rumped Thornbill is found in Eastern Queensland, in the eastern and southern parts of New South Wales, most of Victoria and in the south east of South Australia. They are around 10 - 11 cm in length and weight on average 8 grams. Buff Rumped Thornbill measures 3.5 x 2.5 inches and is painted on 300gsm smooth Arches Watercolour paper. I love how this little painting turned out. Everything just seemed to work. 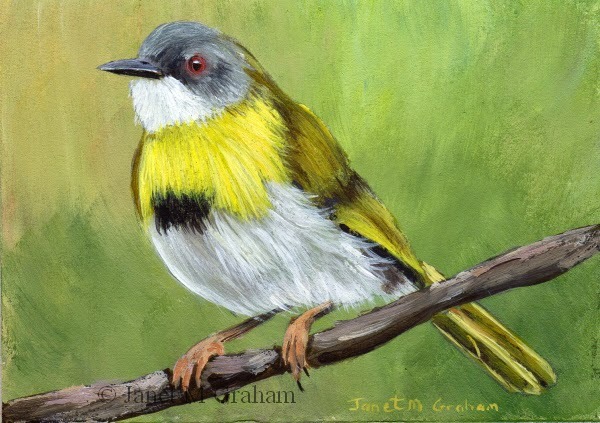 Yellow Thornbills are found in the bottom half of Queensland, throughout most of New South Wales and throughout of Victoria as will into South Australia. They average around 10 cm in length and weight about 6 grams. 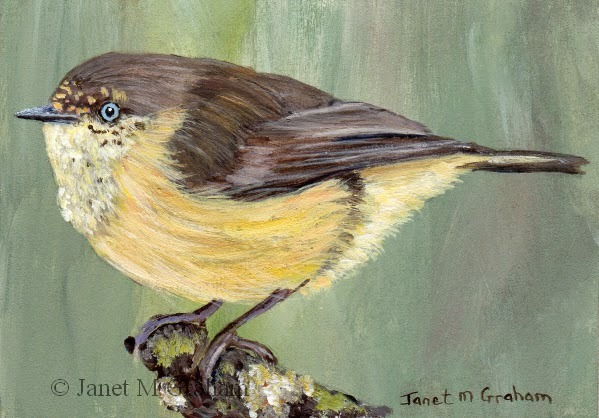 Yellow Thornbill measures 3.5 x 2.5 inches and is painted on 300gsm smooth Arches Watercolour paper. So this is my spring version of the same scene. Really pleased with how it turned out. 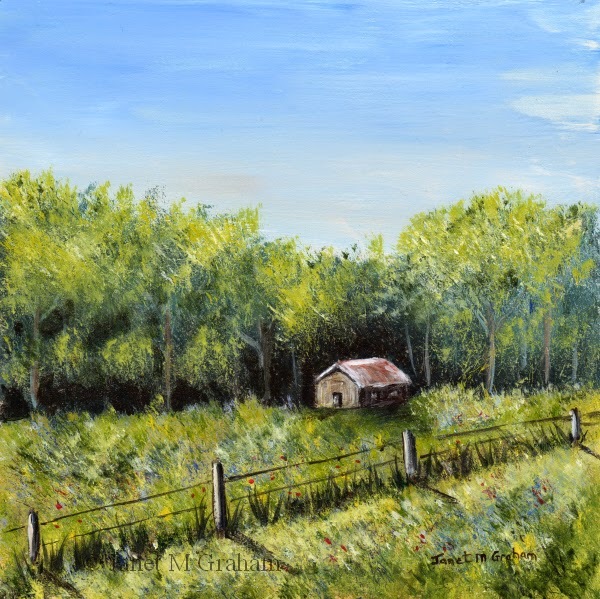 Spring Cabin measures 6 x 6 inches and is painted on Ampersand Gessobord Panel. I have wanted to paint a winter scene for ages. I changed the scene quite a bit when compared to the reference photo - I moved the fence closer, left out a section of trees and added more colour. Really please with the final painting. I really like this little scene so I decided to paint a spring version of the same scene which I will post next. 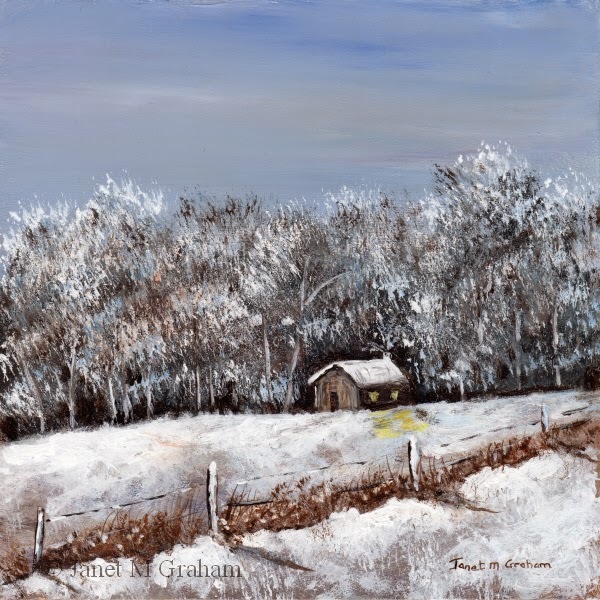 Winter Cabin measures 6 x 6 inches and is painted on Ampersand Gessobord Panel. Many thanks to Joseph Honings for the reference photo. I decided to paint this one in watercolours. Mainly because I could do a wash of colour for the background trees which work really well. 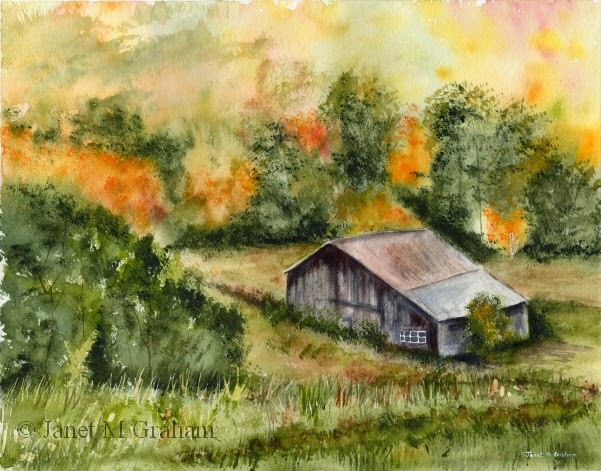 Autumn Barn measures 14 x 11 inches and is painted on 300gsm Daler Rowney "The Langton" NOT watercolour paper. Many thanks to Bonnie Sitter for the reference photo. 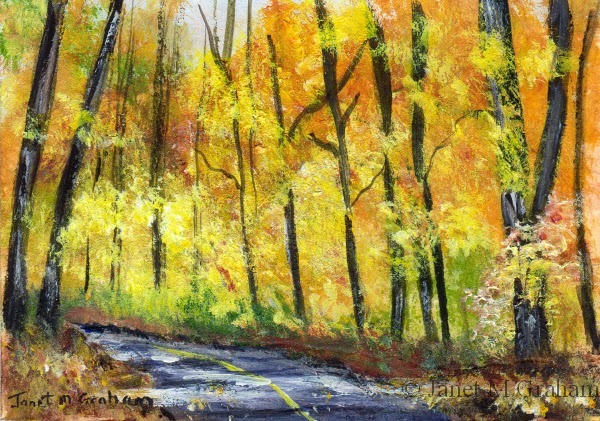 I love painting the autumn colours - they are just so colourful. Really please with how this little painting turned out. 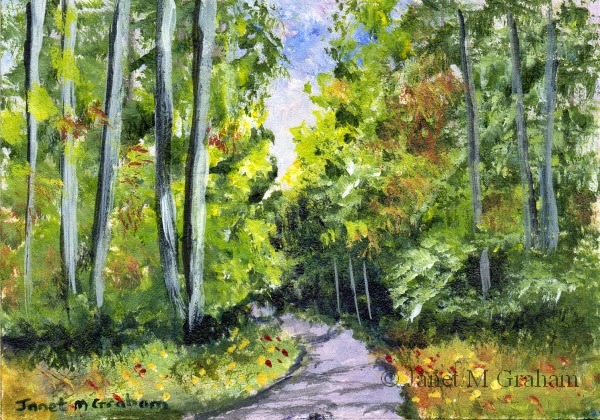 Fall Road measures 3.5 x 2.5 inches and is painted on 300gsm smooth Arches watercolour paper. Many thanks to Gail Young for the reference photo. This one was fun to paint. 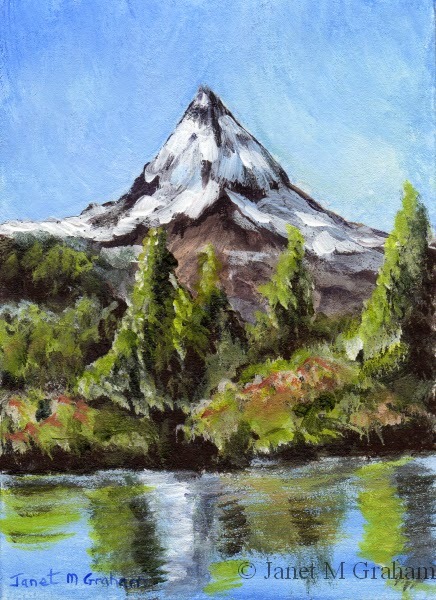 Enjoyed painting the mountain so thinking of painting a larger version of it but without the water. Mountain Peak measures 2.5 x 3.5 inches and is painted on 300gsm smooth Arches watercolour paper. Many thanks to Llja for the reference photo. The Magnolia Warbler is a small songbird found in North America. They measure around 11 - 13 cm in length and weigh between 6.6 - 12.6 grams. 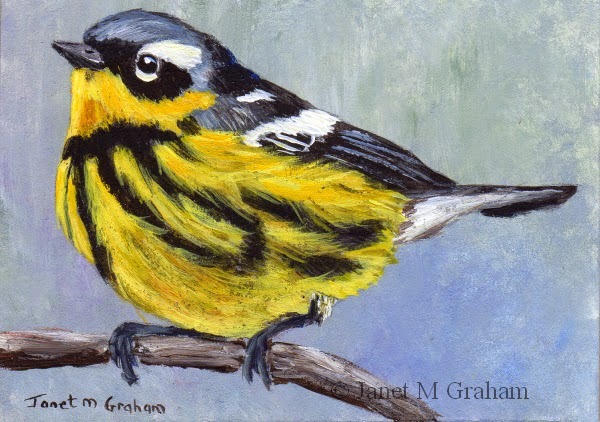 Magnolia Warbler measures 3.5 x 2.5 inches and is painted on 300gsm Smooth Arches watercolour paper. Many thanks to Matt Tillett for the reference photo. I really enjoyed painting this one. Everything just seemed to work. Mocking Cliff Chat measures 3.5 x 2.5 inches and is painted on 300gsm smooth Arches watercolour paper. 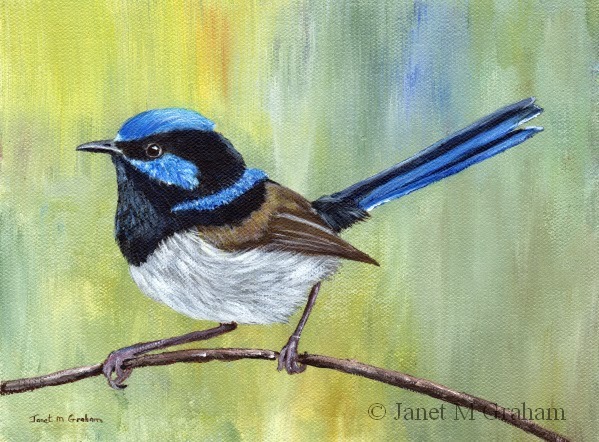 I love painting the Superb Fairy Wren - just love his blue feathers. Really pleased with the final painting. 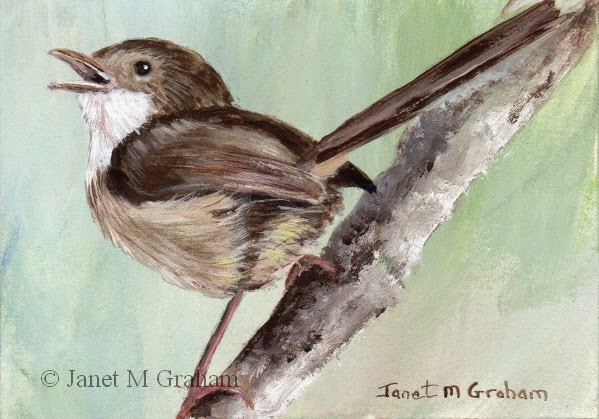 Superb Fairy Wren measures 8 x 6 inches and is painted on Raymar Feather Lite Canvas panel. I really enjoyed painting this one - love the position of the bird on the branch. So pleased with the final painting - everything just worked. For the background, I used a combination of the olive green, blue, touch of red and lots of white which worked really well. 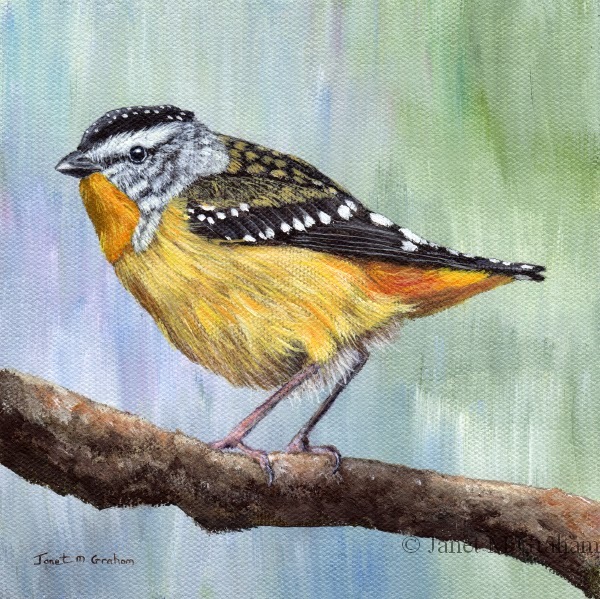 Spotted Pardalote measures 6 x 6 inches and is painted on Raymar Feather Lite Canvas Panel. I changed this one a bit when compared to the reference photo. 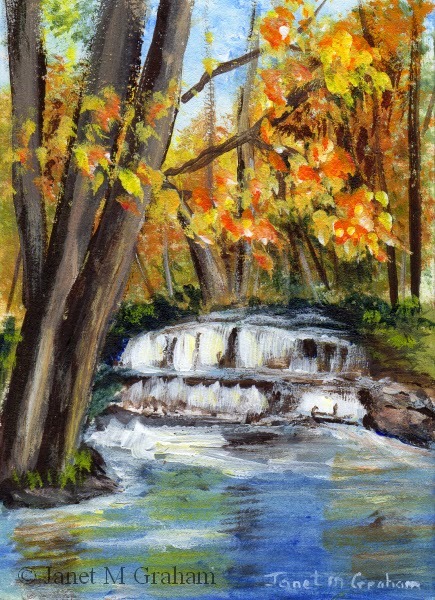 I added in the waterfall and changed the season to autumn - it sort of evolved as I was painting it. Really pleased with the final painting. Fall Waterfall measures 2.5 x 3.5 inches and is painted on 300gsm smooth Arches watercolour paper. Many thanks to Dwayne Gresham for the reference photo. I needed a little break from painting detail so decided to paint a couple of ACEO landscapes. This is the first one. Rather pleased with the final painting. Country Road measures 3.5 x 2.5 inches and is painted on 300gsm Smooth Arches watercolour paper. Many thanks to Beverly for the reference photo. I just love the way this one is sitting on the branch. He was rather fun to paint with the different head angle. Really pleased with the final painting. Ringed Kingfishers are found along the lower Rio Grande valley in south eastern Texas, through to Central America and Tierra Del Fuego in South America. They are a fairly large kingfisher measuring 40 - 41 cm in length. 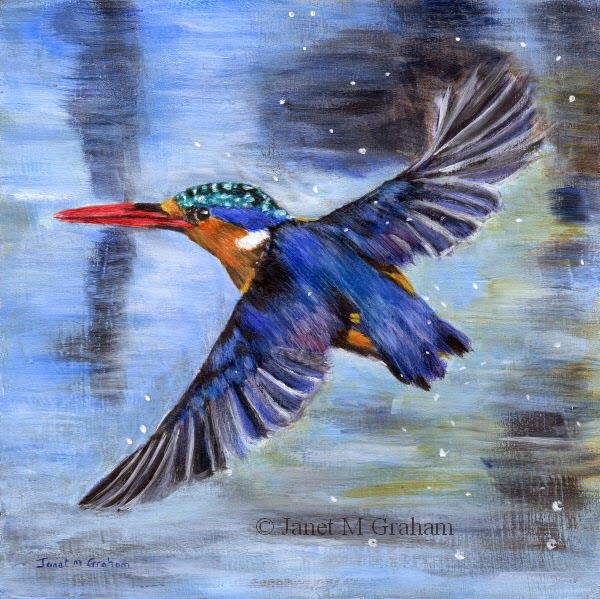 Ringed Kingfisher measures 2.5 x 3.5 inches and is painted on 300gsm smooth Arches watercolour paper. I love the colouring of the bee eaters. For this one, I decided to go for a more mottled background effect which works really well. Little Bee - Eater's are found in much of sub Saharan Africa. It is Africa's smallest Bee - Eater measuring only 15 - 17 cm in length. 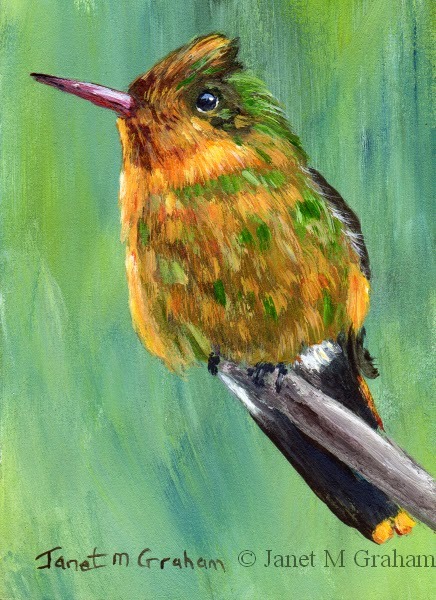 Little Bee Eater measures 2.5 x 3.5 inches and is painted on 300gsm smooth Arches Watercolour paper. The other day I bought I new acrylic colour - Australian Olive Green by Derivan. 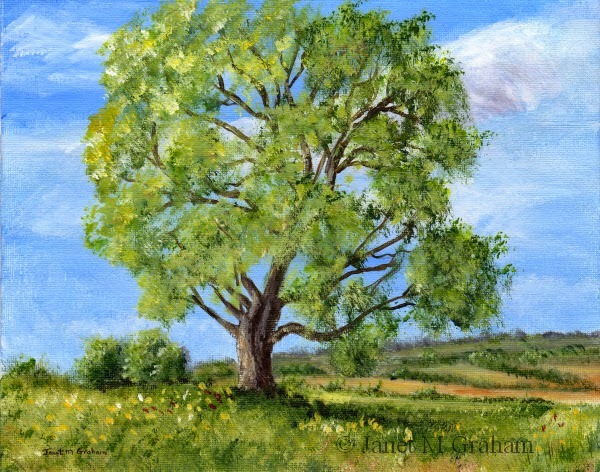 It is a lovely green and quite handy to have when painting landscapes or backgrounds as you can darken it with blue/red or lighten it with yellow / white. The background for this one is the Olive Green plus white and a touch of purple and it worked really well to create a more subdued background. Really pleased with how this one turned out. The Yellow Crowned Bishop is found in Africa south the Sahara. They are about 9.5 - 10.5 cm in length and weight around 15 grams. 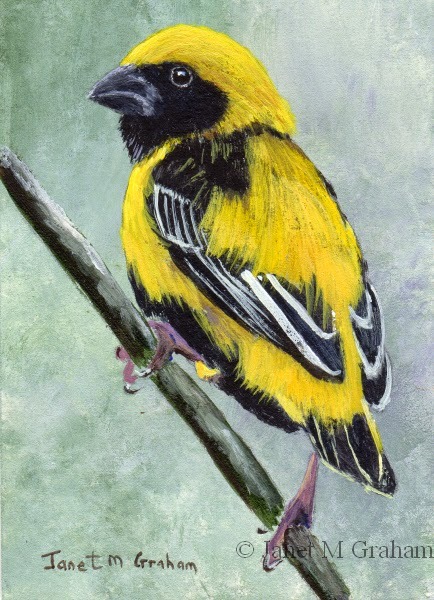 Yellow Crowned Bishop measures 2.5 x 3.5 inches and is painted on 300gsm Smooth Arches watercolour paper. I enjoyed painting this one. I painted the water using glazes which worked rather well. Really pleased with the final painting. 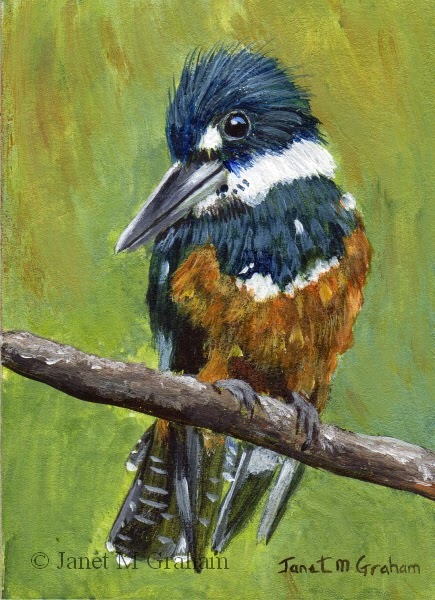 I couldn't resist painting this adorable little fellow and really pleased with the final painting. 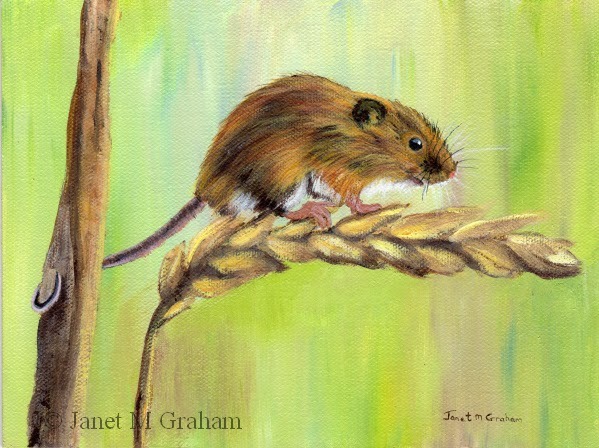 Field Mouse measures 8 x 6 inches and is painted on Raymar Feather Lite Canvas panel. I completely changed the season for this one. The reference photo was a winter snow scene but I decided to paint it as a spring scene. Really please with the final painting. I love the colouring of this bird. I used a combination of Ultramarine Blue, Transparent Yellow, Yellow Ochre and a bit of raw umber to create the olive green feathers - worked rather well. Really pleased with the final painting. 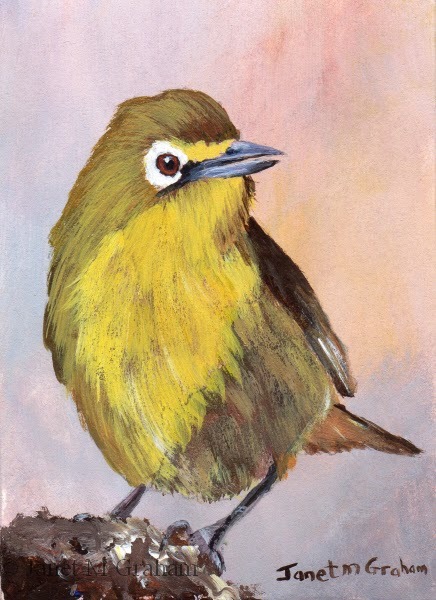 The Yellow Breasted Apalis is found in Sub Saharan Africa and are about 11 - 13 cm in length. Yellow Breasted Apalis measures 3.5 x 2. 5inches and is painted on 300gsm Smooth Arches watercolour paper. For this one, I experimented a bit with the background - I created more of a mottled effect by not blending it as much. I really like the effect that it created so now I want to experiment with a larger background - will see how it goes. Really pleased how this little chickadee turned out. The Black Capped Chickadee is a small songbird found in North America. An interesting fact about them is that they hide seeds and other food items to eat later. They can remember thousands of spots were they have hidden food. They measure around 12 - 15 cm in length and weigh between 9 - 14 grams. 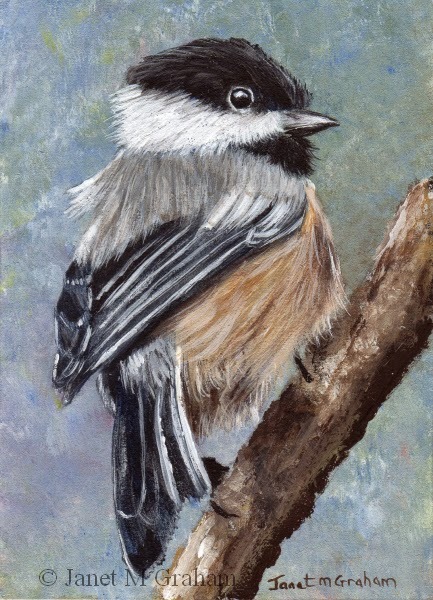 Black Capped Chickadee measures 2.5 x 3.5 inches and is painted on 300gsm Smooth Arches watercolour paper. I ended up having to paint this one twice. I bought new masking tape which I normally use around the border of a watercolour painting. Never had a problem before but when I removed the masking tape this time, it tore the watercolour paper. So I had start again. Second time round I didn't use masking tape - just means I have a more messy border. 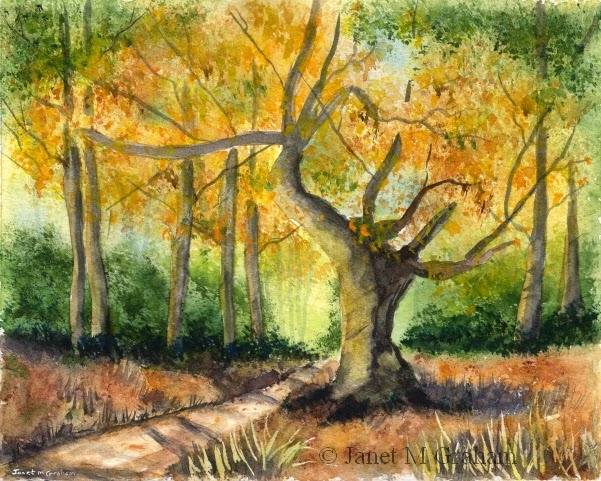 Autumn begins measures 10 x 8 inches and is painted on 300gsm Daler Rowney "The Langton" NOT watercolour paper . Many thanks to Nicola B for the reference photo. I really enjoyed painting this one - everything just seemed to work. Many thanks to Fiona Thompson for the reference photo. I was going through my photos and come across some photos that I took when I visited Girraween National Park a few years back. It is about 260 km south west of Brisbane. 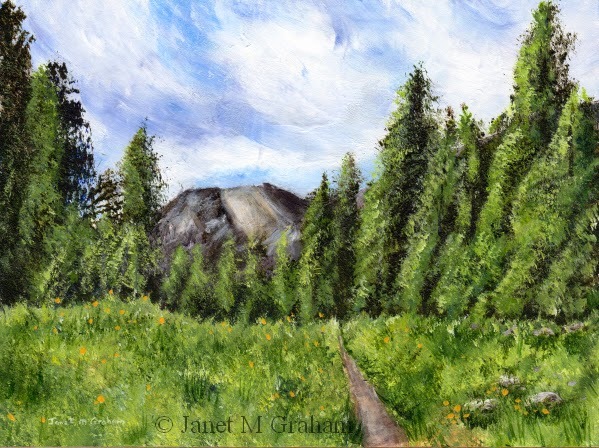 I always liked this scene - it was the path that took you to a small watering hole so I decided to paint it. I am really pleased with the final painting. 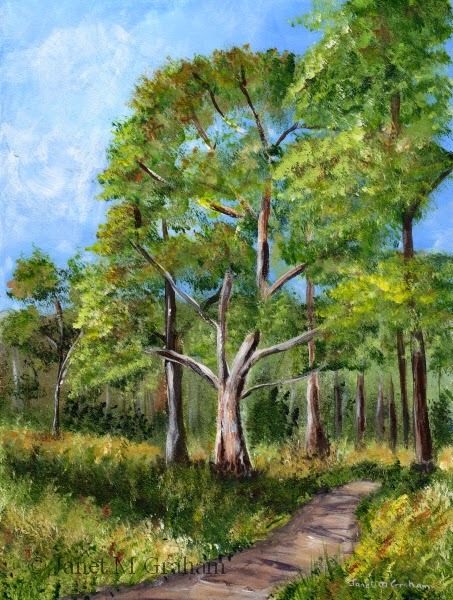 Bush Walk measures 6 x 8 inches and is painted on Ampersand Gessobord panel.